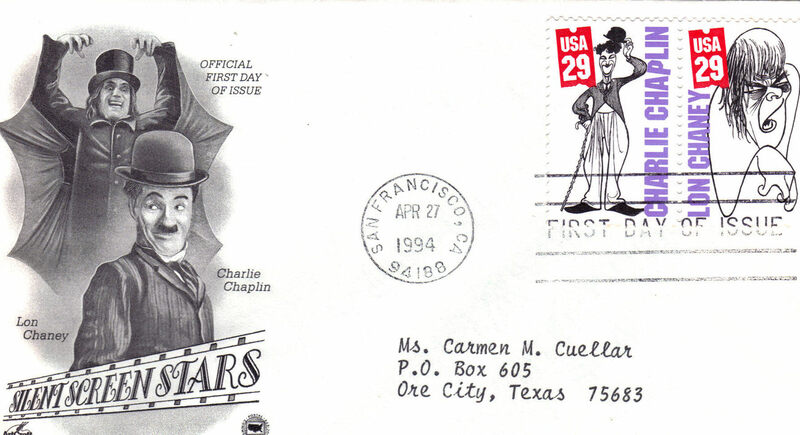 The is the Official 1st Day of Issue for Silent Screen Stars, LON CHANEY CHARLIE CHAPLIN, stamped San Francisco, CA Arpil 27 1994. Licensed by CHANEY Entertainment Inc. 1994 LON CHANEY, born Leonidas Frank Chaney 'The Man of a Thousand Faces,' was one of the most versatile and powerful actions of the age of silent films, best remembered for his characterizations of tortured, often grotesque and afflicted characters and his groundbreaking artistry with film makeup. SIR CHARLES SPENCER "CHARLIE" CHAPLIN, was an English comic actor film director, one of the best-known film stars inthe world before the end of WWI for the silent film era. Chaplin used mime, slapsticka nd other visual comedy routins, his most famous role of which was that of 'TEH TRAMP.' Measures 6-1/2" L x 3-5/8" H Excellent condition Send email if you need additional details. Buyer is responsible for 1.95 shipping to anywhere in the USA Canada. Do check the store for many more Las Vegas Collectibles daily. Thanks for stopping by!